TL; DR: Caspio Founder and CEO Frank Zamani cut his teeth in the industry as a software developer for Microsoft in the late 1990s. He saw the hard work and expertise being poured into the software giant’s in-house tool builds and knew there was a way to give tech- and budget-savvy organizations the ability to create their own custom apps without embarking on costly and extensive development projects. Today, Caspio’s low-code platform is being employed in 100 countries and powers more than 1 million applications. By removing complex programming, businesses are quickly and easily developing tailored apps with little investment and are reaping the returns. Caspio Founder and CEO Frank Zamani cut his teeth in the software industry as a developer for Microsoft in the late 1990s. He witnessed the long hours, hard work and high level of technical expertise required to develop even the smallest software projects and set out to forge a better way. He wanted to empower businesses to easily build custom cloud applications in a fraction of the time and cost of traditional development. “Working at Microsoft, I noticed how much energy, engineering, and talent goes into building tools that were often replicated or modified for various uses across the enterprise,” Frank said. 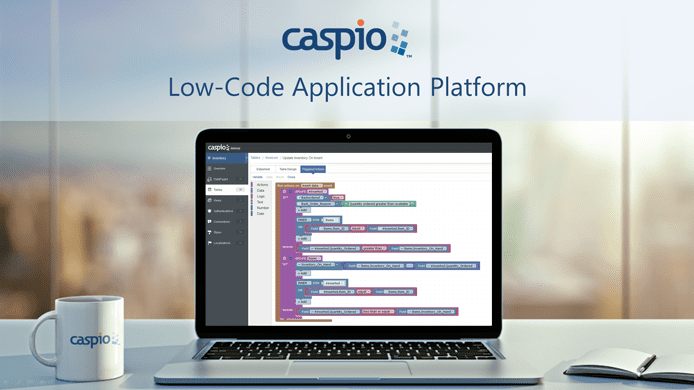 Today, Caspio’s low-code platform powers more than 1 million applications in over 100 countries. Predicted by Forrester to reach a market size of $15 billion by 2020, low-code application development removes complex programming tasks, allowing businesses to quickly and easily develop custom web applications with minimal up-front cost and a significant return on investment. Caspio’s low-code application platform provides point-and-click tools for business professionals to bring their ideas to life. Take Barnes & Noble for example. With more than 770 retail locations nationwide, Barnes & Noble is one of the most popular bookstore chains in the U.S. Additionally, its academic-focused division provides textbooks for over 750 university and college campuses including Harvard, Yale, and Georgia Tech. Initially, Barnes & Noble College relied on a paper-based system combined with Microsoft Excel spreadsheets and Access databases to track store information across all locations. With hundreds of thousands of transactions taking place throughout the academic year, keeping store records up-to-date proved to be an arduous task. Faced with a number of challenges, Barnes & Noble College needed a more streamlined solution and found it in Caspio, a powerful cloud platform that is versatile enough to be utilized by several departments. The Accounts Receivable team needed a data management tool that supported sophisticated financial calculations, while the Field Auditing department required a solution for auditors to take store inventory using mobile devices. Caspio’s low-code platform allowed Barnes & Noble College to develop tailored cloud and mobile apps without the programming complexities that usually accompany custom applications. As a result, the organization was able to lighten the workload placed on IT, reduce reporting time and errors by 25%, and deliver mobile-friendly data to auditors in real time. While impressive, Barnes & Noble’s story isn’t unique. For more than 17 years, Caspio has helped thousands of businesses worldwide radically simplify their software development process. Caspio was founded by Frank with the goal to empower businesses to take software development into their own hands by removing the need for extensive programming knowledge. By providing an ultra-fast and highly scalable solution, Caspio enables non-developers to launch new applications in a matter of minutes or days, as opposed to the weeks or months involved in traditional development projects. Seeing an increasing number of businesses establishing an online presence through the use of web applications, Frank formed Caspio in 2000 and released the first version of the platform the following year. “I wanted to build a tool for businesses to create their own apps without coding,” said Caspio Founder Frank Zamani. Applications built with Caspio make database management accessible to a broader range of business staff, eliminating the need to outsource expensive IT resources. Aside from reducing cost, keeping the development in-house makes the application easier to update when necessary, as the user has direct involvement in the original process. The Caspio platform provides an intuitive web-based interface that requires no installation or maintenance. The visual application builder guides users step-by-step through the design process so they can create a custom application from a wide array of features within minutes. 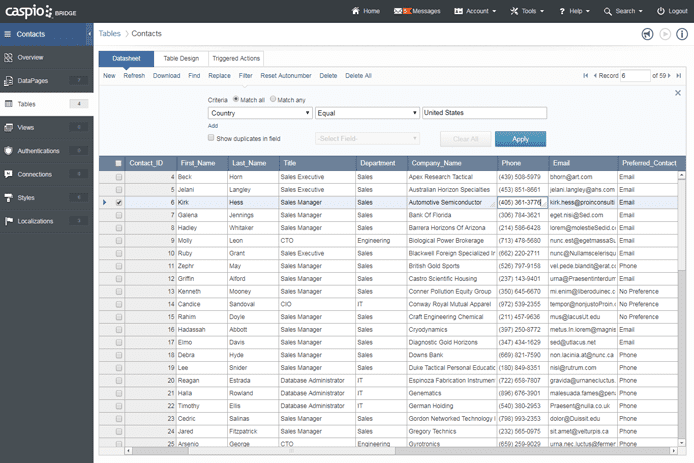 The Caspio platform delivers a fully-managed, secure, and scalable database that users can easily edit. In addition to the highly user-friendly interface, Caspio offers enterprise-grade reliability, security, and compliance. The platform runs on Amazon Web Services infrastructure and is continuously upgraded as technologies and browsers evolve, allowing customers to rest easy knowing their application will always function as originally designed. Caspio’s highly-recommended platform is trusted by Fortune 500 enterprises, government agencies, educational institutions, and healthcare organizations. Since 2000, what began as Frank’s passion project has proven itself across diverse industries and use cases worldwide. Most organizations store a wealth of information in databases and custom applications serve a vital role in day-to-day business operations. Caspio serves thousands of businesses worldwide with a team of dedicated technology professionals. Conversely, shrink-wrapped software tends to be widely distributed, challenging businesses to compete with one another using the exact same product. When businesses rely solely on external development teams to build applications using traditional programming, the result is usually not future-proof — meaning something as simple as a Java update could render the application unusable, even after a significant investment in the original version. Considering the minimal risk and huge potential payoff of going custom, it’s no surprise that the low-code trend has become so popular. By dramatically simplifying the application development process, Caspio puts the power of software innovation into the hands of an increasing number of businesspeople. Inspired by Microsoft, Frank’s dream of low-code development blossomed into one of the most popular PaaS offerings to date, currently used by industry giants such as Cisco, HP, and Verizon. And these big names are turning to Caspio for good reason — low-code application development saves time, money, and hassle for companies looking to achieve maximum efficiency in today’s highly-competitive market.